This is a brief story of all the logistics and adventures around the scientific expedition in which Skanda Coffieldand I (Jaime de la Puerta Salazar), both Instructors at ProTec Dive Centers, participated during May and June. Our adventure started with a very early wake up in the morning of the 18thof May to drive up to Cancun Airport but our efforts would be soon compensated by a nice upgrade to premium economy class, which was really appreciated since we were carrying about 40kg of luggage each and spent a total of 22 flying hours and 10 airport hours between Cancun, New York and Paris. 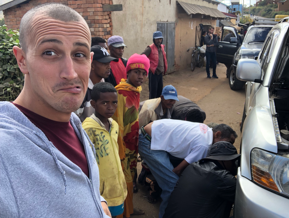 We landed on the 19that midnight and went “straight” (shared taxi which did a one hour tour to drop the other passengers) to our hostel (Madagascar Underground), owned by Ryan Dart, who we would meet the next day and would also form part of the cave diving team. The next day we had our first view of the capital, Antananarivo(AKA: Tana) when JP (Ryan´s friend) came to pick us up and drove us to the cricket field. It was the final match of the league where we would meet Ryan. Ryan was actually playing in the team that won the match. I don´t know anything about cricket but the good news was that the rest of the players in his team were Indian and there was lots of Indian food and very friendly people of Madagascar and all over the world. A really cool welcome into the country. On our second day, we visited the city a little and met half of the science team, Dr. Stephen Burns, Dr. Nick Scroxton (from the City University of New York-Geosciences) and Dr. Zachary Klukkert (from the University of Massachusetts-Paleontology and the only scientist part of the cave diving team). All of them were as excited as Skanda and me to get going to Anakao where the caves are. Day three we left the capital for what it was supposed to be a two-day drive covering 900km to the city of Toliara. The first day of driving we cruised through thousands of tiny little villages separated by lands dedicated mostly to rice growing or mud bricks extraction, all of it done in a very traditional way. It really cool to see how people lived, as well as the constantly changing landscape. We made the overnight stop in Fianarantsoawhere we would meet the other half of the science team, Dr. Laurie Godfrey (University of Massachusetts-Paleontology)accompanied by professor Lovasoa Ranivoharimanana (University of Antananarivo-Paleontology) and assisting both teams were Malagasy graduate students Noramamy Rahantaharivao, Manjaka Rasolonjatovo, and Peterson Faina. The second of the two days of driving we had a bit of bad luck when two of our four cars broke down, we spent about four hours in a small village with a lot of curious people willing to help until we could get going again, so our road trip was delayed half a day since there is a “red zone” where nobody wants to drive at night due to the presence of a tribe who assaults the people of the region. Not too bad at the end because we got to stop overnight in a hotel kind of lost in the middle of nowhere with an outstanding landscape which made up for a really cool sunset and incredible stars at night. The third day of our two-day drive, we woke up with the first lights to cross the “red zone”, drove few more hours and arrived at the city of Toliarato catch the speedboat that would take us to Anakao, our final destination. The boat ride takes about an hour instead of the eight more hours that would take to continue on the road. To get on the boat, since there was a low tide that day, we were taken to it in a carriage pulled by zebus (Malagasy cows), quite cool at first but it left us with a bit of a bitter taste when we saw the way they treated the animals. Once on the boat, the view of the mainland from the sea was quite scenic all the way to Anakao Ocean Lodge, the Onllahyriver guarded by cliffs on each side, some villages on the coast, paradise little islands, perfect waves for surfing, small fishing sailboats and amazing turquoise waters. We had two days in Anakaoto rest from the road trip and prepare for diving, that meant getting the compressor going (it was packed since the previous summer), check all the tanks for leaks, change o-rings and filling them up including our O2 deco tanks, set up our gear, charge lights and check the climbing gear. Finally, our first day of diving. We got up early since there is a one-and-a-half-hour drive from Anakaoto Tsimanampetsotsa Natural Park. A bit of a crazy drive through the deserted landscape on a sandy road with very arid bushes and cactuses on each side. Occasionally we would cross with goat or zebu shepherds or people walking between the three small villages on the way. At the entrance of the park there is the last one of these villages and the tourist info centre of the park, here is where we would stop every morning for the following days to pick up porters to help us carry all the gear and tanks. We parked the cars and started walking towards Aven, about a 15 minutes’ walk on a red dirt path with cactuses on the side and our first Baobabs of the trip, what an amazing weird looking tree! We kept on walking till we got to edge of the ground collapse, the entrance, and what an entrance, we were astonished by the roots of the tree standing right on top of it. We made our way down through the ladder and started to gear up, while at it, the first thing we noticed was the presence and abundance of blind fish in open water where the sunlight could reach, even more excited now we did our final checks and went for an orientation dive of the cavern zone and its underwater museum (set up in previous expeditions). We couldn’t believe our eyes, the number of bones laying on the ground in perfect conditions waiting to be picked up was crazy, on top of it the place had some beautiful light coming in and a very comfortable temperature (29ºC/84F). We located three cave lines starting in the cavern zone, since the cavern was quite shallow (-9m/-30ft average depth) and still had quite a lot of gas, Skanda and I picked one of the lines that started right behind a very cool rock gate with stalactites and went to the end of the line, not a long one this one, came back to the entrance and surface, it was still early in the day so we decided to get out and walk to Mitoho, the nearby cave which is on the way from the parking lot to Aven. The entrance to entrance Mitohowas completely different but also very cool, it reminded me to “Cueva del Agua” in Spain when I dived it in 2016. 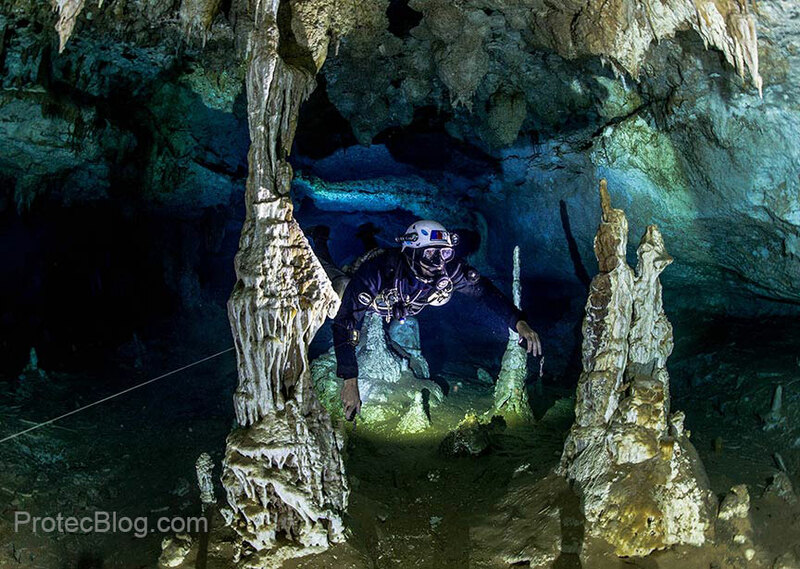 We geared up and went for a cave dive since this entrance has almost no cavern zone. Once in it stayed shallow (-9m/-30ft average depth) for about 10 minutes then we arrive at a chamber with a mountain of guano and the biggest concentration of blindfish I have ever seen, there were easily more than 200, we surfaced and the high ceilings of the chamber were covered by bats, that was the reason for such a high proliferation of blind fish. We went underwater again and followed the line down through the spaces between the rocks in that chamber all the way to the bottom (-33m/-100ft), the floor was a thick carpet of bat bones, we continued in until the tunnel split in two so we picked a left and went to the end of the line, we would have to wait until our last day of diving to check the right side and make it to the end of the line. After a long day and quite a few hours of diving, we passed out in the car all the way back to our hotel. The next couple of days we spent them between these two sites working on the scientific project (read more about it in the article “Madagascar: The Scientific Anomaly of Africa”). Every day when we got back to the hotel we filled the tanks for the next day, then dinner and off to bed, all but one, when we arrived at the hotel we could feel the wind blowing, I run to the beach and there were perfect conditions for kitesurfing (something I´ve been doing since 2013 when I´m not cave diving), I had one of the best sessions of my life, I had the entire bay for myself, Sun setting on one side and the full Moon rising on the other. On our fourth day, we had the chance to go for an epic double stage dive at MalazaManga(“Famous Blue” in Malagasy), this required a good 30 minutes walk and the use of climbing gear to rappel down into a massive depression, once in there we geared up and went for the dive. It started with ups and downs passing mounts of silt that reach almost all the way to the ceiling, after 15 mins we popped out into a huge room and thought: “This is a pretty big cave but we´ve seen similar”, passed the room and continue through a medium size tunnel till it opened up in what it is by far the biggest chamber I have ever seen, so big that you can only see one wall at a time, it feels like diving a big wall in deep ocean, it would easily fit a football pitch inside, the distance to the ceiling is also quite big and the floor is again, a thick carpet of bat bones buried under the silt. At the end of this chamber, the cave continues this time in gigantic proportions all the way. We had an unreal 3 and half hour’s dive. We were exhausted by the time we packed everything, climbed out and walk back to the car, one more day passing out on the car despite the bumpy crazy drive. Another day diving in Avenfor the scientific project went by but we heard that the day before, the Geoscientist team went looking around for more dry caves and they found one with some water in it, we decided to go the next day to look for a possible new access upstream the main entrance of MalazaManga. Today the walk was a bit longer but we were super excited. We arrived at the entrance, this time a vertical chimney; Skanda went down the hole with a backup light about 15m/50ft till he got to the water. There was a pool of water and separated by a little guano mountain a second pool of water with cave line starting on the surface. When Skanda came up I was in wetsuit ready to go for a cave dive to check it out, so I climbed down and waited at the bottom for my gear, Skanda came right after, we climbed the guano mountain trying not to sink our legs too deep into it and cockroaches thankfully ran away to the sides. Once in the second pool we put our tanks on and went for a dive. We tried, without success to dig our way in through passages clogged with silt, found two “Horned Crocodile” (Voay robustus)skulls really well preserved and came back to the surface. “No luck today”, the climb out wasn´t easy but we were happy to get out of there. The next two days we did more scientific work at Aven, Mitohoand MalazaManga.To wrap up the trip, the final two days we participated in the filming of a documentary called Lineages part of a series of documentaries of PBS on evolution that will be released in mid 2019. At the end of the first day of filming, a big group of Ring Tailed Lemurs decided to visit Aven, completely ignoring our presence they started eating some of the fruits in the trees and drinking water from the entrance. Our last day in Anakaowe packed everything up and decided to fly back to the capital, to not risk missing our flights back (due to car troubles) and do a little bit of tourism visiting the Lemur Park and the city. I would like to thank Ryan Dart (the first cave diver jumping into these holes) and all the cave divers from ProTec and DRSS that participated in the previous expeditions and made this possible for us. Also to all the scientist that sponsored our trip and became such good friends. Written by Jaime de la Puerta Salazar.